Seventh Day Adventism - True Denomination or Cult? Seventh Day Adventists claim that a Christian must keep the Sabbath. Is that what Scripture teaches? Or is this legalism? Or worse, are they are cult? The Sabbath was a "SIGN" (Ezekiel 20:20 ) given to the Jews because the Jews require a SIGN (1 Corinthians 1:22 ). The Jews require a SIGN because their NATION began with SIGNS (Exodus 4). The sign of the Sabbath was unknown to every man, woman and child in the book of Genesis for more than 2000 years, for it was first revealed to Moses on MT. SINAI in 1500 B.C. This explains why no one in Genesis ever kept or observed the Sabbath: Adam, Enoch, Seth, Abel, Noah, Abraham, Isaac, Jacob, Joseph, etc. "Wherefore the CHILDREN OF ISRAEL SHALL KEEP THE SABBATH, to observe the sabbath throughout THEIR generations. It is a SIGN BETWEEN ME AND THE CHILDREN OF ISRAEL." (Exodus 31:16-17). "Speak thou also unto the CHILDREN OF ISRAEL, saying, Verily my SABBATHS YE SHALL KEEP: For it is a SIGN BETWEEN ME AND YOU." (Exodus 31:13). "Moreover also I (God) gave them (Israel) my sabbaths, to be a SIGN BETWEEN ME AND THEM." (Ezekiel 20:12). (Nehemiah 9:13-14) "Thou camest down also upon mount Sinai, and spakest with them from heaven, and gavest them right judgments, and true laws, good statutes and commandments: And madest known unto them thy holy sabbath, and commandest them precepts, statutes, and laws, by the hand of Moses thy servant:"
The heresy taught by the Adventists is based on the fact that since Genesis 2:1-3 speaks of the Sabbath as blessed and sanctified, everyone from that TIME (4000 B.C.) on kept it. This conveniently overlooks the Biblical FACT that Moses wrote Genesis 2:1-2 and did not write it until 400 years after Abraham was DEAD. The first day was actually set apart as a sanctified day of rest BEFORE the Sabbath according to Exodus 12:16, and these instructions were given to Moses and Israel BEFORE any law was revealed on Mt. Sinai. Christians in the New Testament do not meet on the Jewish Sabbath. They meet on the FIRST day of the week (Acts 20) and take up collection on the FIRST day of the week (1 Corinthians 16:1-4) and preach the FIRST day of the week (Acts 20:7) because their Saviour rose the FIRST day of the week (Luke 24, Matthew 28) and the Holy Spirit came down the FIRST day of the week (Acts 2:1-6). Now the way the Adventists throw out this barrage of New Testament truth is by pretending that there are two laws in the Old Testament which they call the "CEREMONIAL LAW" and the "MORAL LAW." They classify the Jewish Sabbath as a MORAL LAW instead of a ceremonial law because it is found in the ten "moral" commandments at Sinai. This overlooks five Biblical facts that deal with sound doctrine, and it marks the Adventists as a cult perverting the word of God and twisting the Scriptures. There are MORAL LAWS given right in the same list with CEREMONIAL LAWS (see Leviticus 19:5-9,11-12). There are CEREMONIAL LAWS given right in the same list with MORAL LAWS (see Leviticus 19:17 ,18,19,20,22,23). Notice that the SABBATHS are ceremonial observances to be kept (Leviticus 19:30 ). The New Testament clearly forbids anyone judging you in respect to the ceremonial observances of ANY day (Colossians 2:16 ). When giving the "ten MORAL COMMANDMENTS" in the "MORAL LAW" (to quote the Adventists), Paul purposely omits the SABBATH or the observing of the SABBATH as a MORAL LAW OR A CEREMONIAL LAW (Romans 13:8-10). According to Paul, the Old Testament Sabbath is not a moral commandment for ANY Christian. 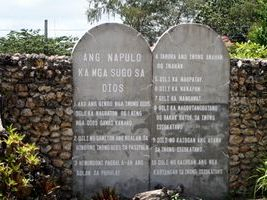 Observe that the Old Testament laws on STONE (the "moral law" of the Ten Commandments) were done away with in Christ (2 Corinthians 3), and the Christian's reason for observing the real moral commandment (Paul omits the Sabbath from them: Romans 13:8-10) has nothing to do with SALVATION. It has to do with good health, testimony, spiritual success, answered prayer, and peace of mind (see Galatians 5; Romans 6-7; and Ephesians 4-5). No Christian was ever saved or was ever kept saved by keeping ANY of the commandments - moral, ceremonial or otherwise (Galatians 2:16).